The Galleria Vittorio Emanuele II is one of the oldest shopping malls in Europe. It is located in the centre of the city near the famous Duomo di Milano Cathedral. 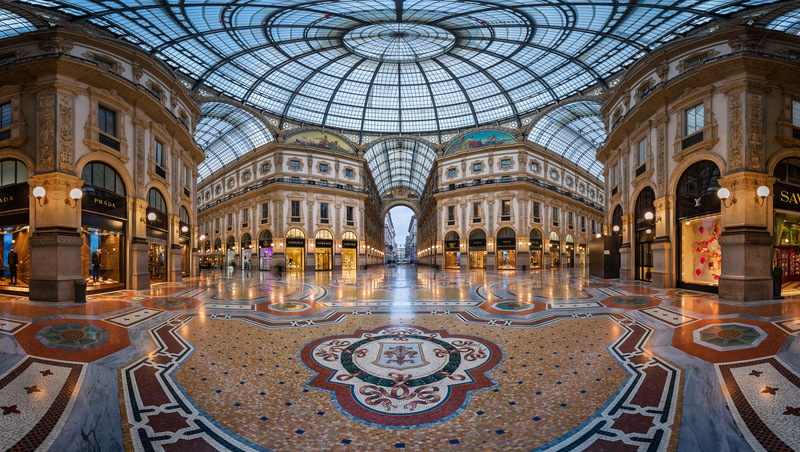 Galleria was designed by the Bolognese architect Giuseppe Mengoni, who had studied in Paris and proposed a large scale, glass covered arcade to connect the Piazza del Duomo with Piazza della Scala. The first stone was laid on March 7, 1865 by king Victor Emmanuel II, after whom the Galleria was named. Although Galleria was officially inaugurated on September 15, 1867, the work continued for almost ten years after to create triumphal entrance. The day before its completion in December 1877, Giuseppe Mengoni fell to death from the top of the almost finished triumphal arch. With its magnificent interior and intricate glass dome, Galleria provids excellent subject for photographer. I used panoramic head to create spherical panorama from 10 shots in 2 rows (5 shots in each row). To handle huge dynamic range of the interior I captured 5 bracketed shots for each image and manually blended them together in photoshop. Panorama from 10 vertical images in 2 rows, additional exposures for highlights, focal length 16mm, aperture f/11, shutter speed 0.6 seconds, ISO 100, tripod, pano head. Postprocessing using Lightroom 5, PTGui 10, Photoshop CC 2014 and Nik ColorEfex 4. This entry was posted in Interior and tagged Italy, Milan.